Welcome to The Fit and Healthy Life! What will you find here? REAL LIFE SOLUTIONS FOR YOUR BEST BODY YET… FREE OF GIMMICKS….That’s right! This is a NO GIMMICK ZONE! I have the answers you are looking for to FINALLY get the FIT body you used to have or have always dreamed of having. But these FitBody solutions are not just for a season or special occasion, it’s for a lifetime. It’s a plan you can live by day in and day out …one that is adaptable and flexible to crazy days and busy nights as well as life events. It’s your solution for the optimal way to live life, a fit and healthy life… at ANY age! You WON’T find the latest trends or fad diets here… However, you WILL learn why these trends set you up to fail every single time. It is about foods for Health and Fitness. You WON’T be hungry on my system. In fact you will eat, a lot! I am not a chef and I’m a very busy woman. I like simple fun recipes with few ingredients. You will learn what I eat and what worked for my crazy life and schedule. I will give you simple diet recipes that are tried and tested and yummy! 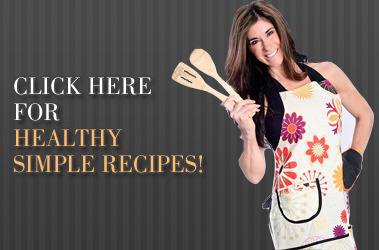 They are truly Healthy Simple Recipes! You WILL learn what the best and most efficient ways are to train, tone and reshape your body…to rediscover you again…and become, when it does for you what it did for me, “the best you yet”…YES, that’s right! I am in better shape and have a more conditioned toned body than even in my twenties! And you can too! And as much as we want that physical transformation, The Fit and Healthy Life is about inner transformation as well. Reclaiming your strength within…becoming EMPOWERED to overcome the mental blocks and issues that derail your “best you” efforts. It is about wholeness and about fully becoming BeYOUtifully You! What about SUPPLEMENTS? Should you use them? What are ANTI-AGING options? I am not just referring to Botox ladies! Learn all the ways to stay young and vibrant…live alive! How do I stay motivated to reach my goals? …get your answers to these questions and MORE! I’m Crystal Tingle, Wife, and Mother of 3, Certified Personal Trainer, Specialist in Fitness Nutrition, Fitness Expert, Fitness Enthusiast, Author, Model and Business Woman AND 45 years old and in the best shape of my life!! The Fit and Healthy Life IS the result of a lifestyle that I now live out and one that is attainable and works for not only my level of health and fitness but will work for you as well. My vision for The Fit and Healthy Life is to share with you ALL of the things that I have spent COUNTLESS hours researching and studying and implementing in an effort to find the answers to my own FitBody solution…AND HERE IT IS!…from a bottom heavy, flabby 40 year old mom of 3 with low self esteem to a strong, confident, empowered fabulously fit and healthy new me! I am passionate about empowering women and helping each one of you rediscover your confidence and zeal for life! As women, we tend to compare and compete everyday against one another. I educate and train to empower and encourage instead! It’s about sharing our experiences and knowledge to help create an environment of teamwork…where we can learn from each other and begin to embrace and engage lasting changes that lead to becoming the best version of YOU by living The Fit and Healthy Life! Ladies, we are on the same team!! Be Healthy, Be YOU and come back often!